2 decks. Easy. One redeal. 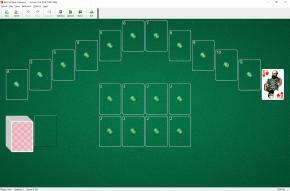 Knaves' Dial Solitaire uses two decks (104 cards). You have 12 foundation piles arranged in a semicircle according to their value (rank) from the Ace to the King. Jacks (Knaves) are excluded from this arrangement. They are placed to 8 piles within the semicircle as they become available. The first card dealt from the stock pile is used to define the starter suit of the foundations. To move all base cards of the starter suit to the foundations and to group all cards on foundations by rank, alternating suit colors. Begin turning over cards from the stock pile to the waste pile. You can move cards from the waste pile to the to the appropriatefoundations according to their rank.